BBC Saturday PM had a great feature about Grenada and it being the leading light in cocoa and chocolate – hope you can listen to it – appearances from Darin, Edmond and others. The piece by Nick Davies starts captured here goes on for about 5 minutes. Its really good – please try to listen. Presenter: [00:00:10] It’s often referred to as the spice island but Grenada is fast gaining a reputation as the cocoa Island. The chocolate industry is worth billions, and there’s a growing demand for the premium and the dark versions. 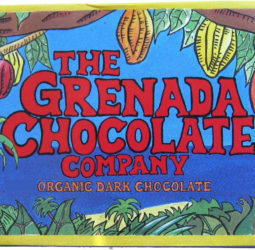 The beans need to make those high-end bars come from a small number of countries, including Grenada. The southern Caribbean island even has a chocolate festival. And the BBC’s Jamaica reporter, Nick Davis, has been there to give us a taste. Nick Davis: [00:00:34] It’s the start of the Grenada Chocolate Festival, and like any good Caribean gathering, you have music. Edmund Brown: [00:00:49] Running faster than Karani in the chocolate industry or anybody else as, Magdalena, congratulations! Nick Davis: [00:00:51] So it’s time to fess up. In Jamaica I make chocolates from bean to bar. I roast the cocoa and then remove the husks, grind the nibs and make chocolate bars. It’s a small side business but it’s something that I enjoy. And I’m here to see how Grenada has become a pioneer in this industry within the Caribbean. Jeff Shepherd: [00:01:09] It just makes sense with these small islands that actually grow really good cacao to do this kind of [undeciphered]. Nick Davis: [00:01:14] Jeff Shepherd is the owner of Lillybell farms, an artisan chocolatier who is one of the best in the US. I’m a big fan of his signature bar, the modestly named “The most awesome chocolate bar, ever!” He’s seen a growing number of people here in Grenada start to look at doing more with the beans they grow. Jeff Shepherd: [00:01:31] One of the big things that I promote, because I’ve always used organics and I totally believe in sustainability, is this kind of value added product. People aren’t just picking cocoa and drying it and selling it. They’re actually producing that chocolate in getting all of the money for it. Edmund Brown: [00:01:48] OK, so we would like everyone to make our way to the buses because we’re now going to go on our way up to the chocolate factory. Nick Davis: [00:01:53] Most of the chocolate we grown in West Africa using bulk cocoa which sells from between three and three and a half thousand dollars a ton. But there’s another grade, fine flavor cocoa, and that’s only in a small number of countries and used in high end chocolates. It costs more to buy, between three thousand five thousand dollars a tonne, and Grenada produces some of the best. Edmund Brown: [00:02:16] Stuff that we roast, we winnow, we refine and we conch. Nick Davis: [00:02:20] The Grenada Chocolate company is a co-operative of farmers and chocolate makers producing organic chocolate. Their award winning bars are sold across the world. Edmund Brown is one of the co-founders. He says a business structure and paying more for organic beans allows more local people to benefit. Nick Davis: [00:02:36] How much more do you pay? Edmund Brown: [00:02:38] We pay a dollar more than the association does. Nick Davis: [00:02:38] That makes a big difference! Edmund Brown: [00:02:38] Yes we pay a dollar more. Edmund Brown: [00:02:40] That’s dollar more per box? Edmund Brown: [00:02:42] Per pound, for wet cocoa, yes. Nick Davis: [00:02:43] So that’s a significant amount. Edmund Brown: [00:02:45] Yes, that’s why we want them to become organic! Nick Davis: [00:02:45] So are people getting on board with this or not? Edmund Brown: [00:02:49] Well we’re taking people every year, we’re trying to get farmers on board, every year. Nick Davis: [00:02:55] As I walk through the cocoa trees with chocolate makers, the debate moves on to how little is known about cocoa and chocolate production. Female: [00:03:03] People have no idea how chocolate’s made let alone where cocoa grows what happens before it’s even roasted, you know? Bystander: [00:03:14] Before I came here I thought cocoa grew under the ground! Septimus Modesta: [00:03:14] We learn. Nick Davis: [00:03:15] Septimus Modesta is a farmer taking part in the chocolate festival for the first time. He’s never seen how the cocoa bean end up as chocolate and when he hears prices that bars go for abroad it’s upsetting. Septimus Modesta: [00:03:27] This process is so simple that we should have been able to do it in Grenada a long time. We didn’t even have foreigners so we shouldn’t need foreigners to come here and show us that frankly. I’ve nothing against foreigners, don’t get me wrong. Nick Davis: [00:03:35] No no no I understand. What you’re saying is that it’s something which could have been taught here, it’s something which should have almost been part of the culture? Septimus Modesta: [00:03:42] I think so!. Nick Davis: [00:03:48] At a tasting, Dr Darren Sooker, a chocolate expert from the Cocoa Research Centre at the University of the West Indies in Trinidad takes us through the different flavors in a variety of bars. Bystander: [00:03:59] A large chocolate, it’s 75 percent, so it’s very strong, but you smell it, very fruity.. it tastes, it smells, it tastes gorgeous, it’s just gorgeous really. Dr Darren Sooker: [00:04:13] And then from the middle onward. Nick Davis: [00:04:15] He says there’s new blood in farming. Professionals are buying up agricultural land and seeing cocoa production as an investment. Dr Darren Sooker: [00:04:23] This is a new class of farmer who is more willing to take a risk, to be more productive, and to capture as much of the value chain as possible. It’s a very, very interesting time. We can either play this hand of cards really really well and win this game or we can muck it up. Nick Davis: [00:04:39] One man who really hopes he won’t muck it up is Aron Sylvester. He’s the man behind the start-up Trials Chocolate. Born and raised in the U.K. to Grenadian parents, he plans to start manufacturing here soon. Aron Syvester: [00:04:51] For me it’s about use what I’d learnt and I guess that’s how it kind of works. You really, you start from one place, you go away, you educate yourself, you improve yourself, and the goal, the end game really, is to come back, and then give back. Nick Davis: [00:05:05] Agriculture was always the main form of trade in Grenada from the 17th century until the mid 1990s when it was replaced by tourism. But now many hope the country’s economy can get a boost from chocolate, to re-cultivate old plantations, and turn the spice island into a cocoa one. Presenter: [00:05:23] Delicious either way. NICK DAVIS in Grenada.